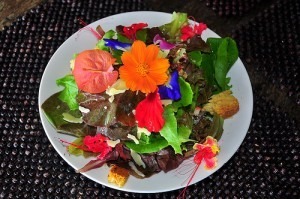 Edible flowers are gaining in popularity as both a garnish and ingredient in popular dishes. It’s a practice that dates back thousands of years in many parts of the globe, with the first recordable mention around 140 B.C. 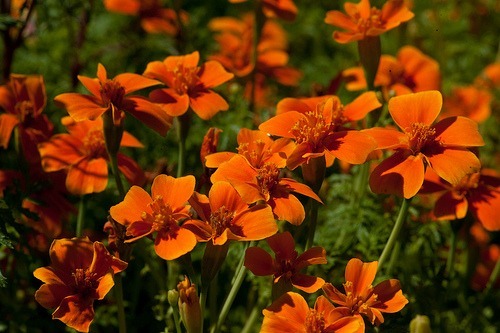 Here are some everyday garden flowers that you may see on a plate. Only eat flowers that you are certain are safe to eat. That bouquet of flowers just delivered by the florist is likely not suitable for your stir fry as pesticides and preservatives are often used on display flowers that aren’t suitable for food crops. Also, be particularly mindful of which flowers you eat if you are prone to allergies. People can have strong allergic reactions to edible flowers such as tulips. 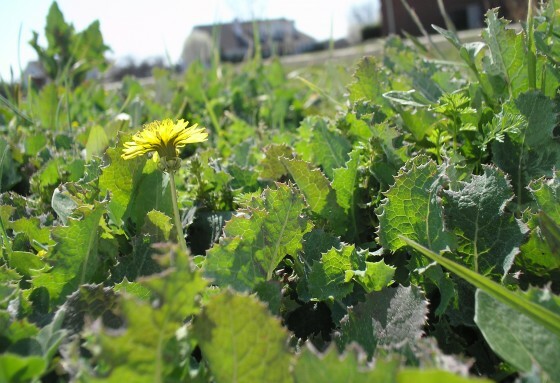 Don’t eat wildflowers from roadsides as these can be especially laced with weed killer. Your best bet is to grow your own edible flowers so that you know exactly what pesticides have been used or not. Or, buy organic and dedicated edible flowers from a reputable store or Farmer’s Market. Remember, some flowers are actually poisonous so make sure you know what you’re eating! Always wash the flowers first. Separating the petals from the pistils and stamens will help prevent wilting and prevent too bitter of a taste. However, it’s OK from a taste perspective to eat entire pansies, violas, nasturtiums and others whole. Perform a taste test prior to using the flower to see if the flavor to your liking. 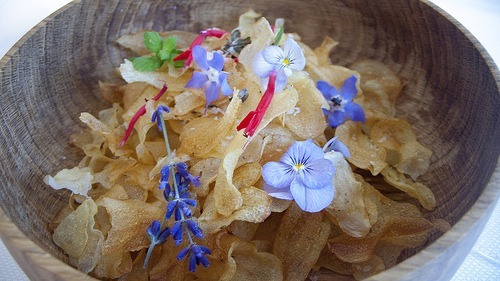 Really, edible flowers can jazz up any dish… even potato chips. The other hot trend seen at restaurants and bars across the country is the addition of edible flowers to cocktails as color garnishes. Clever bartenders also infuse their aromas into liquers and simple syrups to create amazing craft cocktails. Wash edible flowers thoroughly in salt water and then drop them in iced water for 30-60 seconds. Blot dry and then separate the petals to be consumed right away (or serve whole if the flavor permits). If storing the flowers for later, wrap them in damp paper towels for up to a few days. Flowers are highly perishable so they are always best eaten right away. Many people choose to dry the flowers by leaving them out in open air for a day or two. A food dehydrator can also do the trick. Pansies are one of the most popular choices when it comes to edible flowers because naturally have so many interesting color combinations. Unlike other edible flowers, you can eat an entire pansy with ease due to their mild flavor. Pansies are popular choices for topping cakes, appetizers and as a color addition to salads. Liven up plain cream cheese on a cracker by topping it with a beautiful pansy. 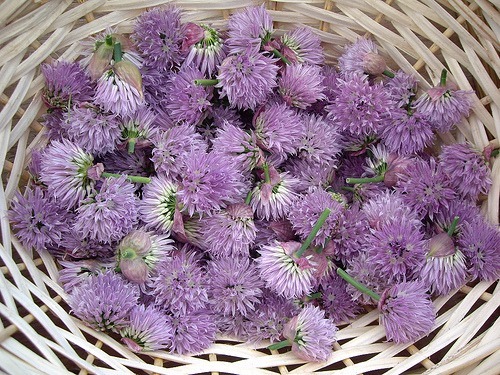 Those who grow chives know that they sprout pretty lavender flowers that are edible and present a mild onion flavor and aroma when added to dishes. Chives are relatively easy to grow even in a small herb garden. Let the chives mature until a flower appears. 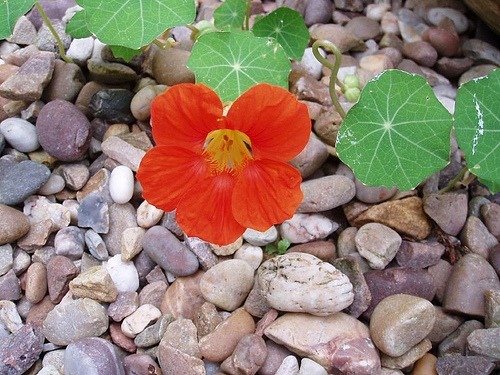 The entire nasturtium plant is edible. The flowers are vibrant pinks, oranges and reds while the leaves have a round, lily-pad-like shape to them. In fact, hundreds of years ago, people used nasturtiums in lieu of pepper by waiting for the seeds to dry and grinding them. In today’s era, the grinding can be done in a coffee grinder dedicated to herbs. Nasturtiums are very easy to grow in Southern California. In fact, they return year after year even after neglect in the worst clay soil. 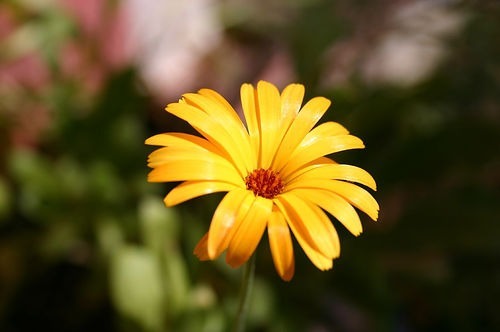 The leaves of calendula flowers can be used as a saffron substitute. In fact, the marigold flower’s nickname is “poor man’s saffron” though to bring out the flavor, you’ll need to chop the flower and cook it in oil. 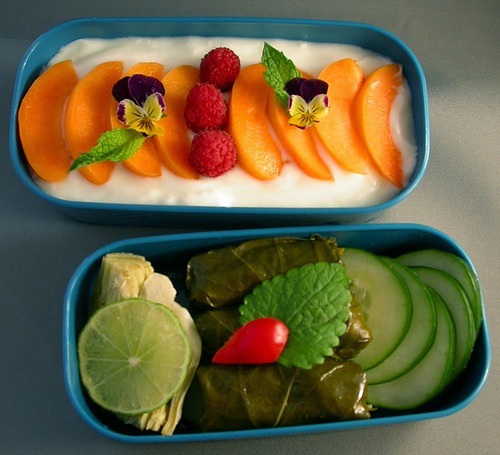 Doing this adds a yellow color to dishes such as soups and rice. In fact, an easy way to prepare saffron is by frying the leaves and onions in oil and adding them to broth when cooking rice to give it a paella flair. 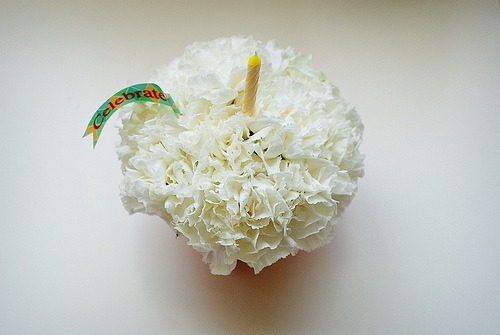 The flavor of carnations ranges from peppery to mild broccoli depending on the color. Carnations are the “secret” ingredient in a French liquer called Chartreuse. These pretty flowers are often steeped in wine to make a candy and used to garnish desserts due to their nutmeg and clove-like flavor. 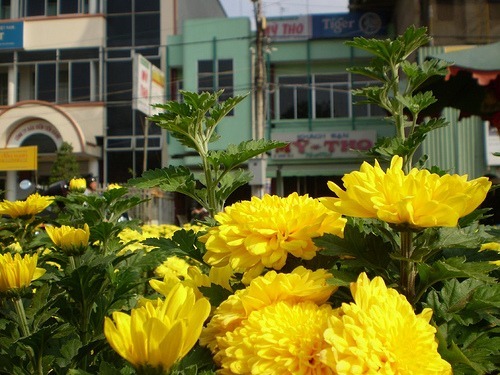 Chrysanthemums are indigenous to Asia and commonly brewed in teas as well as incorporated into a variety of recipes. Their nutrient-dense greens add a bitter taste to stir fries and soups. The flowers are also completely edible. If you have the pleasure of stumbling upon a specialty tea store, buy a chrysanthemum tea and drop it in a glass teapot. Watch as the entire flower reblooms during steeping of this delicious tea. As there are a variety of chrysanthemums available, the taste depends on which you buy. However, most are a bit peppery or bitter while a few are bland. The flower’s base, which holds the petals in tact, is usually bitter so consider removing that before cooking. Crown daisy chrysanthemums, often used as salad greens, look more like daisies than the chrysanthemums above. While they grow mostly as in Southern California, when picked young, dandelion flowers have a sweet, honey-like flavor that will grow bitter as they age. Dandelion leaves are popular additions to salads and some even brew dandelion wine (yes, it is alcoholic). Again, if picking them from your garden or lawn, make sure that you are using natural pest and natural weed control. 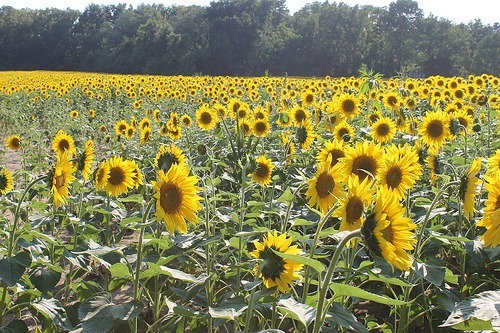 Believe it or not, when sunflowers are still wound up in a tight bud, they taste like artichokes. After the flowers bloom, pull the leaves off and sprinkle in salads or anywhere else you need yellow. And, don’t forget to eat the seeds or use them to attract birds into the yard. 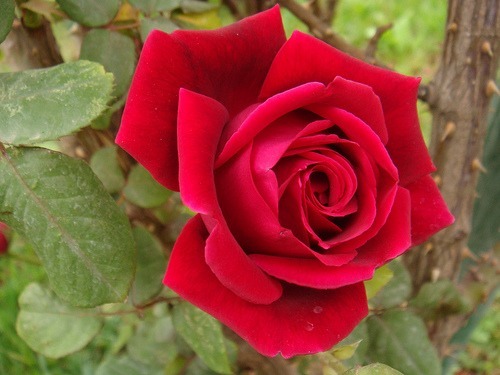 As there are a number of different roses, the flavor is determined by which you use as well as the soil conditions it’s grown in. The typical flavor is reminiscent of what the rose smells like. The fruity flavor becomes more intense in darker flowers. Roses are commonly preserved into jams and dried for tea. Only the gem variety are edible, including lemon gem and tangerine gem marigolds. As their names imply, they do have a citrus flavor but no scent. The flower base and stems are quite biter, though edible. Do you have a favorite edible flower?